DONUT DOG BEDS - FREE SHIPPING Orders Over $69. 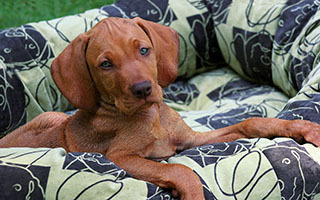 A longtime classic of many of the finest dog bed designers and favored by most dogs. The cushioned outer ring creates the feeling of security pets love, and typically they may have a removable inner cushion can be used as a crate mat or travel bed. These beds come in a variety of fabrics from microvelvet, faux leather, cotton, hemp, microsuede and even faux fur. Always a favorite with dog and owner alike.